I have been a plasterer for over 35 years and have had my company since 1981. I will give free friendly advice and free estimates. 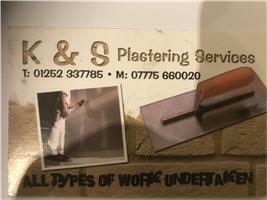 I am a sole trader with experience of all types of plastering, re-skims and refurbishment. If you need just one wall or a whole house plastering and/or refurbishing, turn your old house into a new house at an affordable cost, also I specialise in skimming over artex ceilings get 2 or more done at once I will give a reasonable discount, will also decorate the ceilings to finish the job without having to find another tradesman.